I’ve had a difficult last two days. First, my sister made me an Aunt (HOORAY!!!!). That was the good part. The bad part was that her son started having respiratory distress and had to be flown to a different hospital to be placed in a NICU. Being 20 hours away from her and entirely broke, there is no way I can go to be with her right now. My heart is simply breaking for what she must be experiencing, having her child taken away with little explanation, being left alone in an unfamiliar hospital (her husband went to be with the baby), and then having to figure out how to pump since she can’t nurse her baby. Wow. Please check out their post here. Thirdly, and very minute in comparison to the above, my daughter didn’t sleep for even an hour straight last night. I think she’s teething again because she wants to use me as a pacifier when teeth are about to come in. So on top of having pregnant hormones and the emotions of this weekend, I didn’t get any sleep. I’m at work today and just want to be at home and in bed. I’m telling myself that it’s okay because I basically got to spend the ENTIRE night praying for my beautiful sister, her husband, and their sweet new baby. And my own sanity. Seeing as how you’re all people with real lives, too, I thought maybe someone else could use some encouragement today. 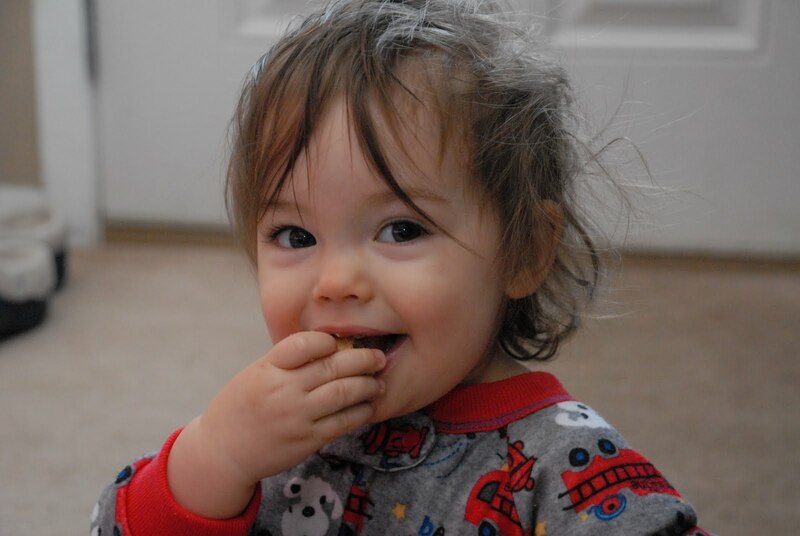 So instead of continuing my 1st Birthday Bash!, I will be postponing that until tomorrow and will leave you with this today: Eat Cookies for Breakfast. 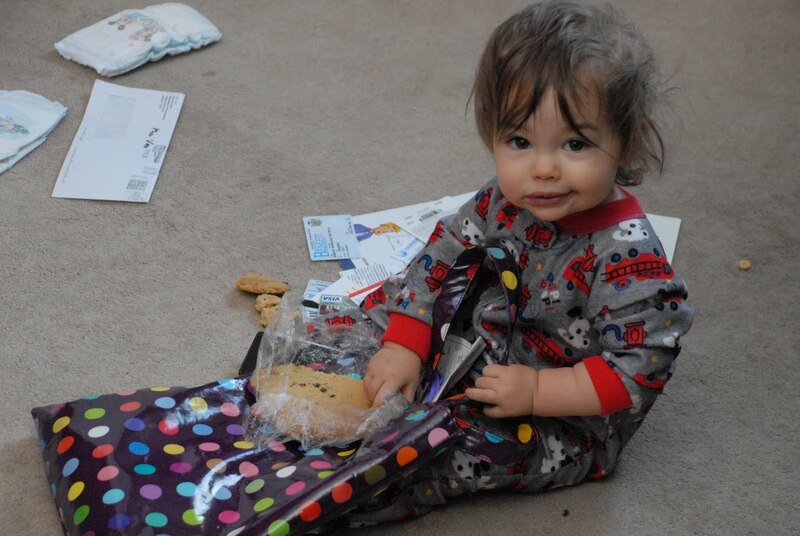 My 14-month-old daughter, eating a giant chocolate chip cookie for breakfast. 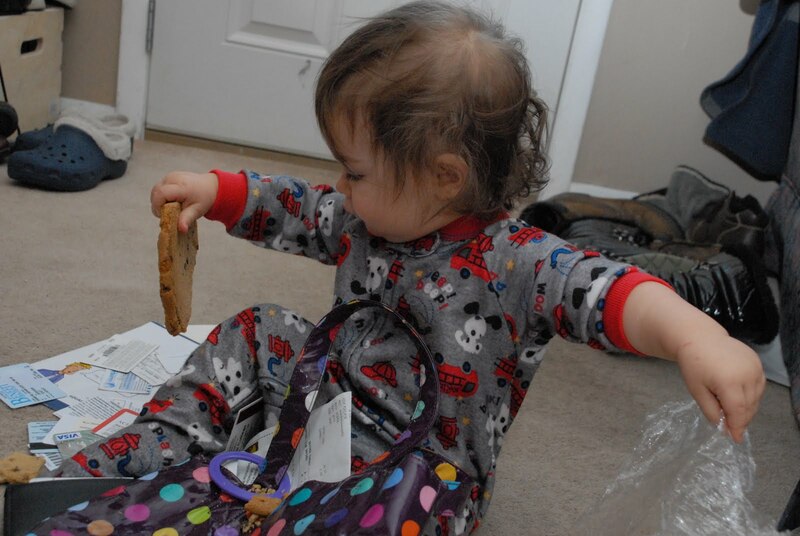 She found the cookie wrapped in plastic wrap in the bottom of my purse-bag. After disecting the contents of my wallet (hence the pile behind her), she was immediately distracted upong realizing there was not only plastic and card stock pieces in my bag, but food, too. The cookie was leftover from a lunch I had at work, and silly me, had left in my bag. So just in case you are having a terrible, horrible, no good, very bad day, just remember: it may be because you didn’t eat cookies for breakfast. I love that your daughter is in fire engine PJ's. So dang cute! You know that we're praying for B, N, and little N. Still praying. Adding your friend to the list.